Another Year, Another Memorial Day. Today was hot, finally, and I spent some time in the garden which had suffered from neglect: first from a cold spring and second from my two and a half weeks in Hawaii. I missed the red bud tree’s blooming and most of the Texas bluebonnets, but now it’s iris and peonie time, both gifts from my childhood. I don’t have the hybrid kind of either iris or peonies. My cousin Howard gave me peonie roots his mother had dug from her yard and my cousin Linda gave me yellow iris rhizomes from Grandma Sunderland’s yard. Vita, an old neighbor from the farm years, gave me bags and bags of those purple iris that smell like grape pop. That’s the kind I remember from the garden my Grandpa Ellis tended. Good years, they bloomed right on time in mid to late-May. This is a good year. Peonies are what you’ll see in any small town cemetery in Kansas. At least the part of Kansas I’m from. Masses of peonie bushes, in bloom, all at once. Makes a trip to the cemetery worthwhile. 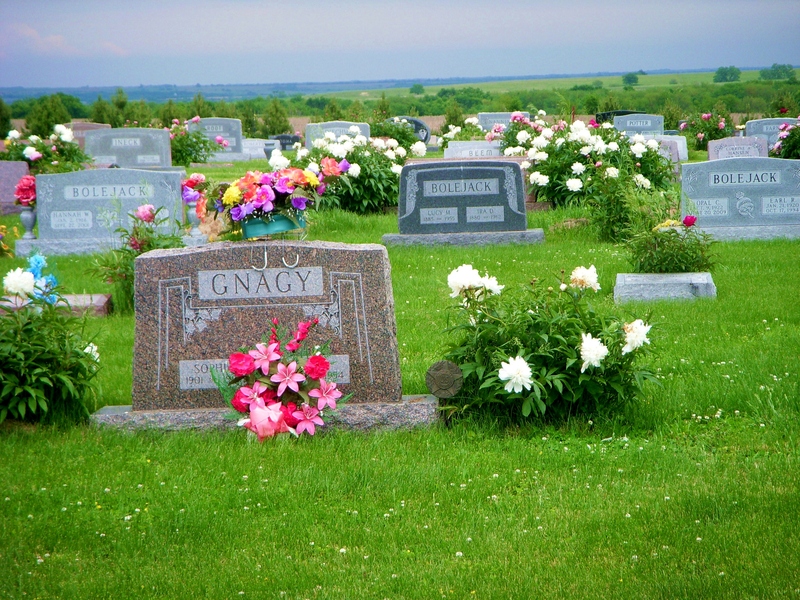 And this weekend, you will also, if you’re a mind to go traveling cemeteries, see cut peonies, stems wrapped in paper towels or aluminum foil, or stuck into a fruit jar with water, resting in front of stones. Once in a while, you’ll see iris but they don’t keep so well. You won’t see many artificial flowers. Our run goes through four cemeteries: Barneston where my mother and step-dad lie alongside the rest of Dad’s family-the Bruckers homesteaded the place we call The Farm; Barnes to my father and older brother’s graves; Frankfort to say hello to my mother’s Ellis and Moore family-the Quaker Moores came to Kansas at the end of the Indian Wars; and Vermillion where the Sunderlands and my grandmother’s family, the Laws, keep each other company-both families immigrants from England in the mid-1800s. These the stories that follow me as I pruned my garden. After pulling some weeds, moving a flowering plant I’ve forgotten the name of but overcome by a burgeoning hydrangea, and planting some wildflower seeds in an empty space, I cut the first bouquet of white and pink peonies and set them on our dining table. “Those peonies?” my Baltimore-city-born husband asked when I brought them in. “Yes they are,” I said. And we smiled.